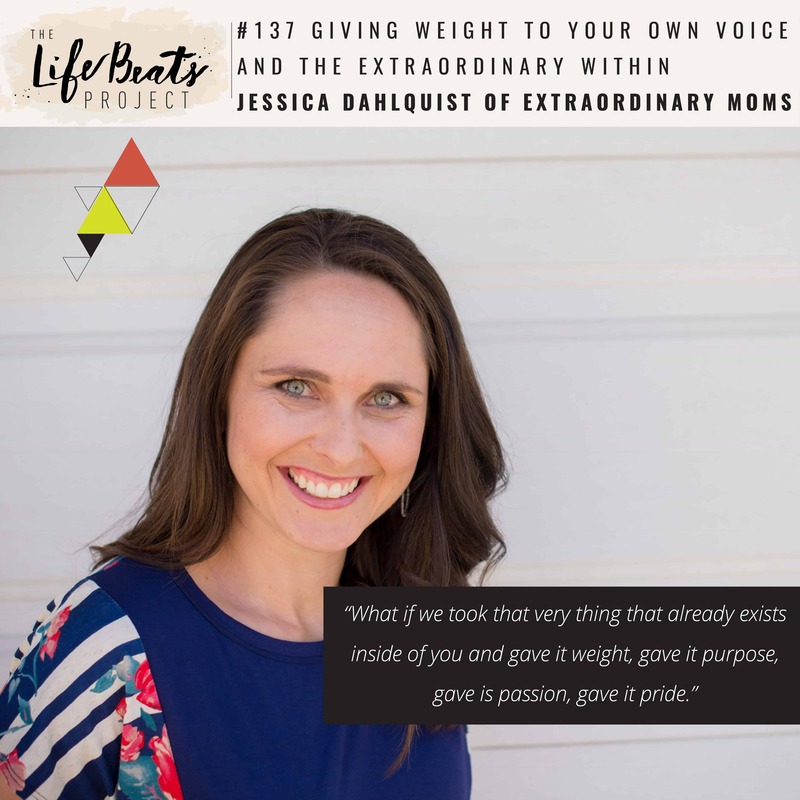 On today’s podcast I get to welcome one of my friends, Jessica Dahlquist, the podcast host of Extraordinary Moms. Despite her admittedly feeling like she is in a funk, her influential messaging shines through. Today we have a powerful conversation about giving your own voice weight and how your voice is needed in this world. We talk about the transitions in our lives and friends, you know that there’s been a few in mine and there’s definitely been a few in hers. And how we share the joys as well as the challenges that have come into our lives for ourselves as well as for our children. Jessica shares the importance of self care for her and how hers is comes in the form of taking time for reflection. She invites us as listeners to be able to answer these questions of : Who was I before this transition or this change or the circumstances in our lives and Who have I become because of this experience. Jessica also shares what has been the common thread after three years of doing interviews on our podcast to being successful in navigating trials. And how a lot of times we don’t want to share in the middle of our trials or in the middle of our mess. We don’t want to share until after we have this big bow that can tie on the top of our lesson that we’ve learned. She is so passionate about this lesson that no one needs to tell you that you are extraordinary, that you don’t need the validation from outside, that you have to be the one that knows it yourself. Be Confident in yourself and what you can offer, what your voice is, the extraordinary inside of you. Does that sound familiar? I know that it does. So friends listen to and be inspired to give weight to your own voice and know that no one besides yourself needs to validate that extraordinary that already exists inside of you to make the best at a transitions for both you and your family and to invest in yourself as a best way to take care of others and to feel whole no matter our life circumstances. Be sure to stay tuned after the interview for a preview of next week’s episode. Friends. I am so thrilled to be able to connect you with some incredible brands that will add value to your life and are willing to share their own personal stories to connect and contribute to our community here and in the world. So friends, today’s episode is sponsored to you by Para, an app for the busy person who knows emergency preparedness is important but wants it to be easy. At the end of this episode we’ll be speaking with Jenna Lindsay, a minimalist prepper. Yes. You heard that? A minimalist prepper and how she uses the Para app to ensure that her emergency supplies are organized and easy to find. I love her story of being a little girl and reading the boy scout manual and secret. So check it out.